With the holidays approaching, it's a great time to shine a spotlight on the many kind and giving members of our Rosslyn community. In this series, Rosslyn Cares, we feature stories from our neighborhood that remind us of the importance of taking care of others and being thankful for what we have. Amanda Baity knows what it feels like to have a spouse who's struggling after returning home from being deployed. It's hard. And often, she says, it feels like there are more services out there for families of active duty personnel than for families of veterans. "Your spouse may return from combat and be back, but not truly back," she says. Amanda is so invested in ensuring that there's support for returning veterans and their families that in 2014 she and her husband, Christopher, founded a nonprofit dedicated to helping them. It's called Semper K9, and it provides veterans disabled in combat with service dogs. The organization is unique because Semper K9 doesn't breed service dogs, which is common practice, but rescues them from shelters. Also unusual is the fact that they provide support and training for veterans and their families before they receive the dog. 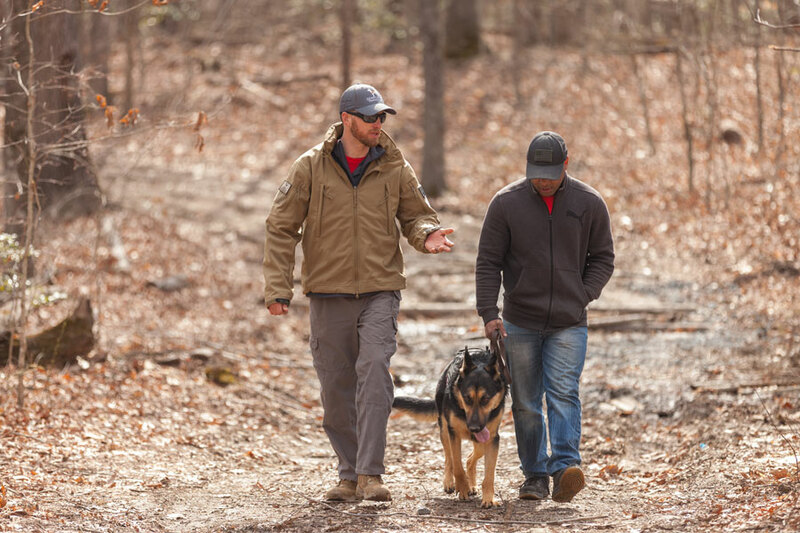 This makes it easier for the dog to become integrated into family life and ensures that caregivers and other family members have the skills needed to help further the veteran's recovery through animal-assisted therapy. On November 4, Rosslyn's Barley Mac will be hosting a fundraiser to support the nonprofit. Guests will pay $20 for a wristband that will grant them admission and access to happy hour specials at the event. Tito's Handmade Vodka will be matching contributions. Representatives from Semper K9 will be on hand to answer questions and may even bring along a few of their dogs in training. In the run up to Veteran's Day weekend, it's a great opportunity to support members of our military and an award-winning nonprofit while enjoying one of Barley Mac's well-orchestrated events. Christopher Baity outside of Baghdad along the Tigris River with one of his working dogs. Baity was deployed to Iraq three times beginning in 2003. The story of Semper K9 is inspiring even as it shines a spotlight on the difficult circumstances many veterans face upon returning from combat. 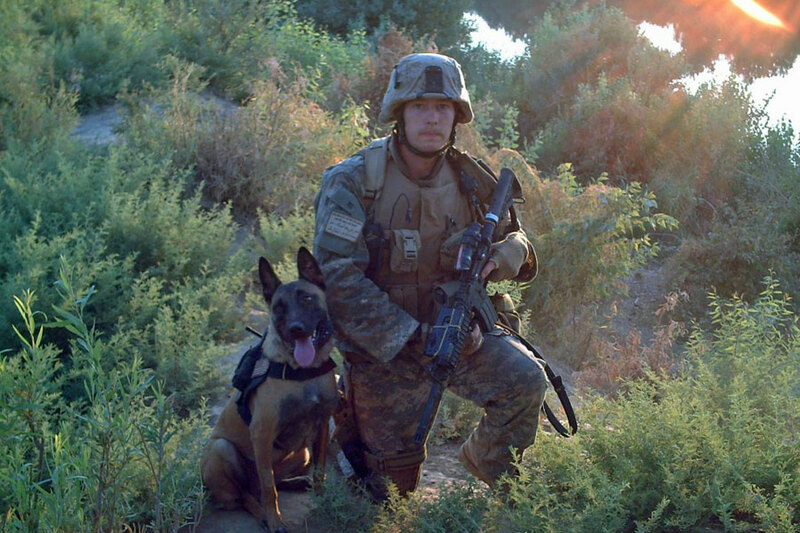 Nonprofit co-founder Christopher Baity spent his military career as a working dog handler. He was deployed to Iraq three times beginning in 2003, to Israel as a Marine in 2006, and to Afghanistan as a civilian contractor in 2009, where he worked with dogs trained to detect explosives. He was excellent at what he did, but the stress of the job took its toll. When he left active duty in 2008, he struggled with post-traumatic stress disorder and drug and alcohol use. After bouncing around to a variety of contract jobs, Christopher began to work with his wife Amanda to start up their own nonprofit that would enable him to use the skills he gained in the Marines to help other veterans also experiencing difficulties after returning from combat. The Baitys run Semper K9 out of their home. Christopher trains the dogs and relies on volunteer K9 coaches to provide assistance. Most volunteers come in with little or no experience as dog trainers, but receive guidance from Christopher on how to get a specific dog ready for placement with a veteran and his or her family. 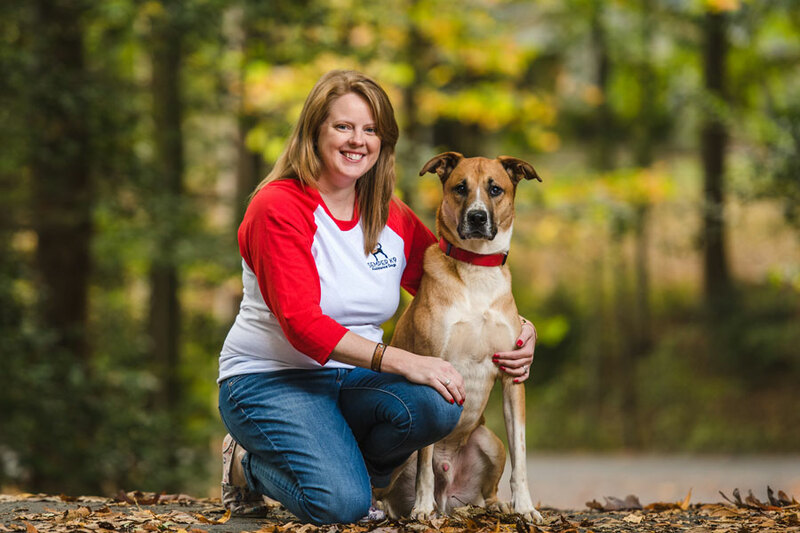 Dogs stay with a volunteer coach for up to a year until they are matched with a veteran. Christopher Baity (at left ) and a veteran work with a service dog. Baity founded Semper K9 because he wanted to use the skills he gained in the Marine Corps to help other veterans overcome difficulties after returning from combat. Amanda, who serves as director of operations, says about 100 veterans apply for a service dog per month. Of these, only about 10 actually end up being matched with a dog. There are many reasons for this: The veteran must have a documented disability to qualify, and many applicants do not. Some find that they aren't able to come to training twice a week. Others find they're not well enough to proceed. Each veteran must complete 120 hours of classroom training before receiving a psychiatric or mobility service dog. The veteran's family members are trained, as well. "We're a military family with five children, and I know if my husband brought a service dog home and we didn't know anything about it, it wouldn't work," Amanda says. "Most of our veterans tend to be in their late 20s or early 30s and many have families with small children. So, we bring in a veteran's whole family and teach them obedience commands, pet first aid and other important skills—even small children." Amanda says Semper K9 has a 100 percent success rate for dogs they've trained. And the fact that Semper K9 trains rescue dogs is notable because, besides saving the life of an animal, it also significantly lowers costs. Most service dogs are bred specifically for that purpose, which is far more expensive. The majority of the rescue dogs Semper K9 trains are Labradors, Retrievers, German Shepherds or cross-breeds of them. At the moment, Semper K9's team is focused on an 8,000 square-foot, retreat-style facility they're building in Fauquier County not far from Marine Corps Base Quantico. It will provide a much-needed space where veterans who are preparing to receive their service dogs can stay while the vets themselves are in training. Amanda says those wishing to support Semper K9 can view a wish list on their website that details current needs associated with the project, including pro bono design and construction services. They also accept supplies and have a wish list on Amazon. "For the number of dogs we put out, we have a smaller budget," Amanda says, "so any form of support is always much appreciated." Amanda says she is looking forward to the upcoming fundraiser at Barley Mac. "We're always appreciative of people who host events for us," she says. "It's important because it provides a great opportunity for us to reach new people, including those who may need our services." Semper K9 Director of Operations Amanda Baity with Norman, a service dog in training. Photo at top: Christopher works with a dog. All photos courtesy of Semper K9. 1. See About Us page on Semper K9's website.